I drove 1,200 miles from Ohio to hunt Merriam Turkeys in Nebraska with Scott Croner. The trip proved to be one of the best hunting decision I ever made. I was able to arrive at Uncle Buck’s Lodge by noon on the day before my scheduled three day hunt. Since the previous hunters had already tagged out and the weather forecast for the next few days wasn’t good, Scott told me to grab my gear and off we went. An hour later I had my trophy Merriam. Fortunately I have a good heart as this bird was taken at 6 yards. The next day, in a snow blizzard and 30 mile per hour winds we navigated a long stalk on a trophy Rio Grand Turkey which I harvested at 35 yards. Scott Croner is second to none, when it comes to turkey hunting. If you listen to what he tells you in preparing for and during the hunt, you will kill birds. Croner enhances the hunt with his knowledge and enthusiasm for turkey hunting. He understands and shares in the excitement and the importance of your hunt. With the pending bad weather, I was pleased to be tagged out on the first scheduled day of my hunt by 11:00 am, with two trophy birds. Not only was it a great hunt, but the accommodations and hospitality at Uncle Bucks Lodge was first class. The food was fabulous and I even got to check and feed cattle with (Walt) the owner of the ranch. Not regrets on this trip! I highly recommended this hunt. Go prepared and be ready! It can be fast and furious. 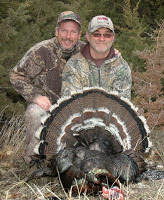 This entry was posted in Fully Guided Spring Turkey Hunt, Merriam's Spring Turkey Hunt, Nebraska Turkey Hunting Guide and tagged Fully Guided, guided turkey hunts, Nebraska Merriam's turkey hunts, Wild Turkey Grand Slam. Bookmark the permalink.